PIONEERTOWN – As one of the kickoff events of the “Miss Burro” contest, some of the young contestants from Big Bear and the Pioneertown- Yucca Valley area exchanged visits and ticket-selling sprees over the weekend, it was reported by Samuel A. Moore, Pioneertown activities chairman. The “Miss Burro” contest is the first event of the 12th Annual National Burro Derby, which 5, this year will be a three-day run between Pioneertown and Big Bear Lake, starting Aug. 5, Moore disclosed. 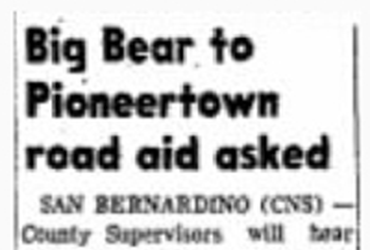 The two visiting contestants from Big Bear were Pamela Seaman and Gerry Kusisto, said Moore, who acted as their official host. The girls were guests of the Yucca Inn, had dinner given in their honor at the Crest Room Saturday night, put in a guest appearance at the Landers Moose Lodge the same night and had a special Sunday breakfast at the Yucca Valley Country Club before returning to Big Bear, said Moore. Desert girls who exchanged visits by traveling to Big Bear last weekend were Gretchen Ann Yaeger, Yucca Valley; Linda Lee Lugan, Desert Hot Springs; Robin Grubaugh, Yucca Valley; and Sandra Canham, Rimrock. The girls stayed at the Paramount Lodge and were dinner guests of the Swiss Inn, it was reported. Other contestants from this area are Marlene Galloway, Pioneertown, and Frances Kelly, Landers. Ticket-votes for all the girls are available at all Pioneertown, Yucca Valley, and Big Bear merchants, as well as from the contestants themselves. The winning contestant will receive a complete Western outfit and be crowned at the Coronation Ball in Pioneertown on July 31, Moore declared. She will reign as “Miss Burro” during Pioneertown Days from July 31 to Aug. 4 and alongside of “Miss Clementine” in Big Bear from Aug. 5 to 8 throughout it’s Old Miner’s Days. Proceeds from the contest will go to sponsoring Old Miner’s Association. William Snyder, president of the Big Bear association, is working with Moore on the contest and the Burro Derby. The new route of the race is from Pioneertown, starting on Aug.5, through Yucca Valley, north on Old Woman Springs road to the Flamingo section of Landers – Homestead Valley, where the burros and wranglers will spend the first night. 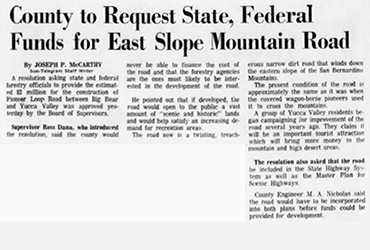 The second day they start at Lucerne Valley, travel to the top of the grade in Big Bear Valley, then in an east and south route past Baldwin Lake to the Shay Ranch and second night’s stop. Next morning, the last day, it’s on to Big Bear City and the finish line at the Elks Club at Big Bear Lake – a total distance of approximately 41 miles. 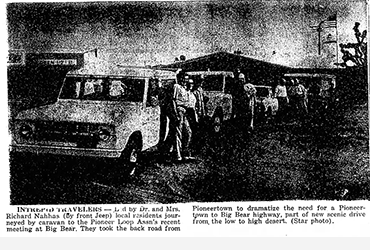 Moore states that the burros will arrive in Pioneertown on July 23. Thirty wranglers have signed up for the derby, so far, he said. Each burro must be sponsored at a cost of $100, he declared. All people interested in entering as wranglers or sponsors of one of the burros are asked to contact Moore or Kenneth Bonser at Pioneertown.